Stanbic Bank has pumped K1.5 million into the construction of the Jubilee Women’s Integrated Highway Market Project. Work on the long-awaited project was recently inspected by Republican Vice President Inonge Wina. The programme is designed to level the playing field for female entrepreneurs and promote the heightened participation of women in the economy. The initiative, spearheaded by the Vice President’s office, will integrate individual roadside micro-businesses into collective economic hubs for women and youths to create wealth. Speaking during a tour of progress on the project recently in Chibombo, Wina said the government wanted to transform highway markets into world-class models for female empowerment through entrepreneurship. She also commended Stanbic Bank for donating K1.5 million towards the project. Central Province Minister, Sydney Mushanga, said the government would be celebrated in the country’s history for its unwavering support of micro-enterprises. And speaking at the same event, Chief Chamuka said the project was important because it would stimulate increased economic activity and the spirit of entrepreneurship among women and boost their family income. Meanwhile, Stanbic board chairman Austin Mwape said: “Stanbic Bank is proud to be associated with the project because providing merchant solutions for small and medium-sized enterprises (SMEs) is one of our core values. As a bank, we work to deliver solutions to support women, who make up the majority of traders in the identified highway areas. He added that the bank would continue to supplement government efforts in uplifting urban and peri-urban economies through women empowerment and programmes like the Jubilee Highway Market. Stanbic has over the years been supporting women through entrepreneurship training, mentorship, access to finance and markets programmes and advocacy. 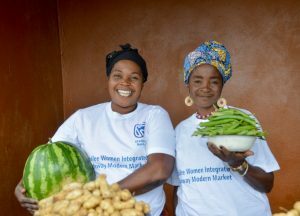 “It is for this reason that in December 2012 we launched the Anakadzi Centre for Women Empowerment and Development, which has been branded as a business development organisation and has been supporting women in Zambia,” said Stanbic Bank’s chief executive officer Leina Gabaraane. Gabaraane, speaking after event, said the bank remains committed to supporting local businesses, SMEs and corporates alike with its Business Connect Centre now rendering financial services to over 10,000 SMEs. Government plans to build a minimum of 10 highway markets in each province under the Jubilee Women’s Integrated Highway Initiative Programme. The markets will include facilities such as Automated Teller Machines (ATMs), health and educational services, with the Chibombo market on the Lusaka-Ndola Highway as the starting point.